#Fisher was named interim coach just before the beginning of the 1989 NCAA tournament. * -- Due to NCAA sanctions, the University of Michigan has vacated the records from the 1992 Final Four, the 1992/93, 95/96, 96/97, 97/98 and 98/99 seasons. Games affected are: 170 total games, 113-57 overall games, 50-36 Big Ten, 7-4 NCAA, 5-0 NIT and 4-1 Big Ten Tournament. It also reflects vacating the 1992 Final Four appearance; the 19997 NIT Championship; 1993, 1996 and 1998 NCAA tournament appearances; and the 1998 Big Ten Tournament championship. Based on consensus first-team (#) and and second-fives of leading selectors - writers, coaches, and wire services - as compiled by the NCAA Statistics Service. 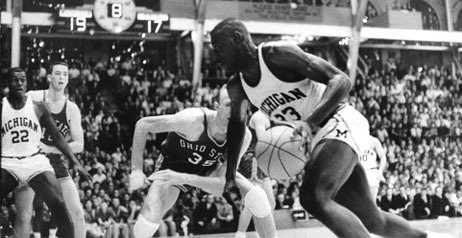 * an italic text indicates individual player records, awards and other honors that have been vacated by the University of Michigan due to NCAA and U-M sanctions. Scans of team photos, 1909, 1918-2007, from original prints and negatives, copy prints and half-tone images from the school year books or other sources. There are multiple photos for some years. Click the "Description" tab on the image page to see captions and other information.